CropCool Wireless offers a bespoke solution to grain store monitoring and fan control. The modular system allows CropCool Wireless to be designed around your needs. From simple monitoring to fully automated fan control - CropCool Wireless is the perfect option. CropCool™ Wireless improves fan control for optimum crop cooling and conditioning in up to eight separate zones. This is particularly helpful for larger grain stores or multiple grain stores. Temperatures can be viewed on a farm-office computer or remotely in an off site office etc. CropCool™ Wireless can operate as a store monitoring system to monitor store data quickly and easily. Closed system- does not rely on internet. Option to export data to web-i.e. remote stores. Multi-zone fan Control- automatic temperature differential control and RH control. Example 1: - Monitoring only- 2000Tonne Grain store / 24 Pedestals / 1 Sensor per 300Tonne approx. 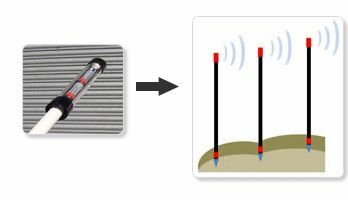 How many CropCool™ Wireless Grain Temperature Probes are needed? Can I use CropCool Wireless for either ‘Monitoring’ or ‘Control’ Only? Yes – the system is completely modular with all components compatible with each other. A bespoke system can be created to suit you needs, be it monitoring, fan control or both. Can I start by just ‘Monitoring’ only or ‘Control’ only & upgrade to Control later if it suits me? Can I add more stores to the system?